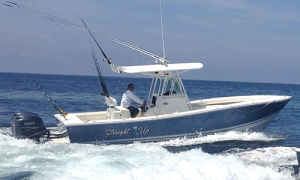 This modern, newly refitted and customized 26ft Regulator powered by twin 250HP Yamaha outboards fishes out of Los Suenos Marina in Playa Herradura. Captain Carlos is at the helm, assisted by a bilingual mate. It sports a T-top with plenty of shade, marine head, a full tournament-class range of Penn International, Fin Nor and Shimano tackle, along with a full electronics package including depth sounder, chart plotter and GPS; and all the required US Coast Guard-approved safety equipment.